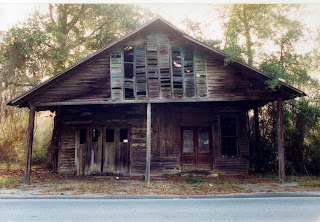 I found this abandoned structure in southeastern Georgia some years ago. I took the shot on film and scanned it as it needed a lot of work. The backlighting was very strong and there was lots of photoshopping, at least for me, required to bring it out. I like the look of it as it appears somewhat haunted. I also have no idea what the building was. The double doors on the left and the huge array of shutters upstairs leads me to believe it might have been a feed store but this is very close to the coast and isn't a real agricultural area although it may have been back when this building was built. If anyone happens to see this and has an idea or the actual history I would greatly appreciate it.